Controversy over the Chao Phraya promenade isn’t showing signs of abating anytime soon despite the Bangkok Metropolitan Administration’s insistence on pushing ahead with the 14km riverside project. After being criticised for being hastily cobbled together and posing a threat to the lives of people and aquatic animals that depend on the area, the promenade could find itself in a legal mess. Krai Tungsanga, member of the Consulting Engineers Association of Thailand (CEAT), said the BMA’s hiring of King Mongkut’s Institute of Technology Ladkrabang (KMITL) to carry out a study of the project — for cash — violated numerous laws. 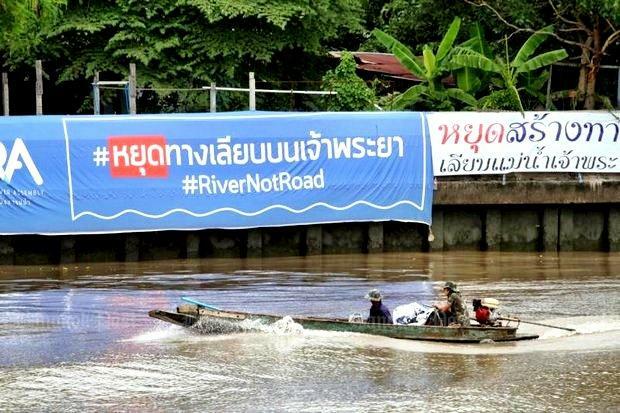 The institution, with Khon Kaen University as its adviser, was paid 120 million baht to study a 57km stretch along the Chao Phraya River’s banks, from the Rama VII Bridge to Bangkok’s outskirts, to assess the impact the project may have on local communities. The institution was required to design the promenade, conduct the environmental impact assessment and hold hearings to gauge the views of the public, especially riverside communities. KMITL lacked the “legitimacy” to carry out the job, said Mr Krai, because the institution does not have a licence to conduct engineering studies. Only private companies can be awarded engineering assessment licences and as such they are the only ones that can carry out such studies for money. His association is preparing to ask the Council of Engineers to decide whether KMITL was allowed by law to conduct the study. In carrying out the study for payment, the institution has violated the 1999 Engineering Act, the 1999 National Education Act and the 2008 KMITL Act, he said. Section 45 of the Engineering Act stipulates that a person cannot work as an engineer unless they have a licence from the Council of Engineers. According to the the National Education Act and the 1971 King Mongkut’s Institute of Technology Act, the institution must be committed to teaching and offering educational services to society. KMITL was formed after the amalgamation of three technical colleges: Nondhaburi Institute of Telecommunications, North Bangkok Technical College and Thonburi Technical College. Mr Krai’s association wants the Council of Engineers to look into the role KMITL has played in the promenade project and consider imposing “punishments” on the institution and its rector Suchatvee Suwansawat should it be found to have violated the law. The fresh claims against the 8.4-billion-baht project come as the BMA plans to call bidding later this month and follow a string of complaints over the handling of the project’s execution, including its timing, public hearings and engineering problems. Opponents have said the seven-month time frame of the study was too short to allow experts to do an in-depth assessment of the impact of the project. Despite the KMITL’s claim that it welcomed public participation, the project’s critics, especially the Association of Siamese Architects, say authorities did not engage in dialogue with stakeholders to gather diverse opinions. 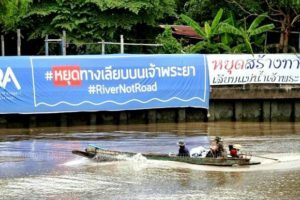 Former president of the Engineering Institute of Thailand, Tortrakul Yomnak, has said the people building it will likely have to hammer “more than 1,000 posts” into the riverbed. This will cause a negative impact on the buildings surrounding the river along with the lives of aquatic animals. The project plans to double as a wall that will keep the city dry during the rainy season. Critics have said river communities will be booted out of their homes to pave the way for the construction. But all these gripes seem to be falling on deaf ears. City Hall expects to drive the first pile in July this year after the planned bidding in April. The construction period will last about 18 months.